1. Small and beautiful air purifier for small room, easy to carry, USB Power line. 2. Isolate the floating dust in the air and mold spores. 3.Improve breathing; reduce the incidence for allergies and pets. To improve the heart, Cerebrovascular disease symptoms. 5.Improve the quality of sleeping; eliminate neurasthenia. 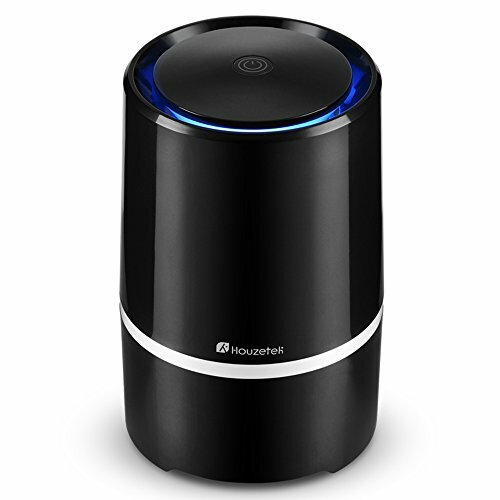 Intelligent and Quite Sleep Mode: This air purifier filtration have two mode(normal mode&sleep mode). Entering sleep mode, the unit will automatically turned off after 8 hours. Low working noise throughout the night, less than 32DB. it won't disturb you no matter sleep in the bedroom or noon break in the office. Refined Appearance, Advanced Materials, Eco-friendly Design: Refined minimal design, advanced materials solid construction: the purifier is more wear-resistant and practical; 100% ozone free, does not emit UV or Ions which produce trace amounts of measurable ozone, np harmful air pollutants. Portable and Compact: Compact Size. 500 grams to cover an area of about 10 cubic meters. Perfect solution for small areas and rooms such as studio, bedroom, office desktop, bedroom, kitchen, pet room. Perfect high-tech gift idea. 2-year warranty and lifetime support. If you have any questions about this product by Houzetek, contact us by completing and submitting the form below. If you are looking for a specif part number, please include it with your message.